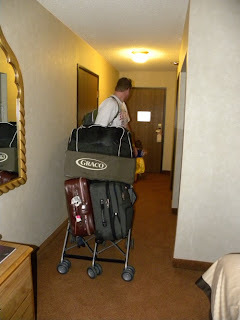 This post is a little longer because of the several paragraph rant on the hotel craziness at the bottom..
We left William early in the morning and headed west towards Nevada. The wind was insane as we sat in the car in parking lot waiting for Paul to return with breakfast from Safeway, and it actually felt like the wind moved the van several inches, despite the fact that we were in park and had the emergency break on. Once we were on the road I couldn’t help but marvel at the elevation signs. William is a little below 7,000 feet above sea level. And the descent down, with the increasingly desert-y landscape, was still at surprising heights. For some reason, today, my navigating skills were seriously lacking. I missed two exits that we were supposed to take. 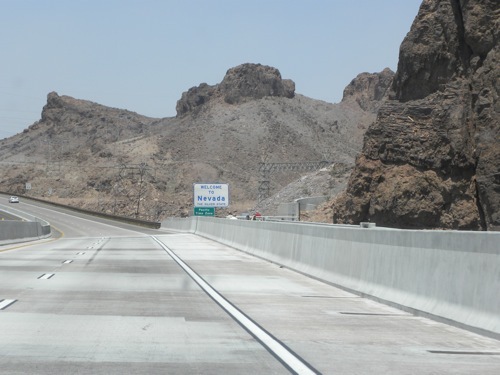 Unfortunately one of those exits was the last off ramp for ten miles, resulting in a twenty mile round trip mistake. Crafting and navigating don’t always mix (and knitting kept winning out when it came to keeping my attention!). 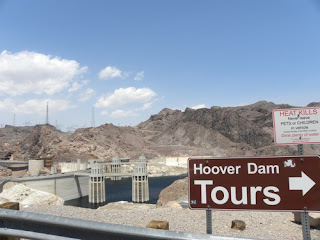 We got off the freeway to see the Hoover Dam and after snapping pictures headed through a dust storm to Vegas (where I missed another turn). But honestly, but the time we arrived at the Exacalibur, I was pretty focused on the last leg of the trip and getting home. It’s not that traveling with a toddler and preschooler across the country hasn’t been fun, because they’ve surpassed every expectation that I had about the long trip in the car by being pretty solidly cheerful the entire way (I’m beginning to suspect that both actually enjoy long car rides… there was certainly a lot of loud, off-key baby singing! ), but I was ready to be in one place for more than a day and to not be packing and unpacking every 12 hours. We arrived at the motel and were instantly mugged greeted by a hotel employee who rushed over and guided us to a desk while asking us if we were ready to check in. I was a little confused as check in was still three hours away and we’d been planning on getting lunch, but I went along, because they didn’t really allow a chance to say no, and because having a room key instantly would have been pretty nice. Instead the sales pitch began. They wanted us to go on a two hour tour of a new resort and if we did we’d get to see the jousting match (or a choice between a number of other shows) for free. I thought this was a little crazy. I know that Sadie and Mae were looking awfully cute in their princess dress, and were being particularly quiet at that moment in time but still… you want to ship us off on a two hour tour of a resort? After a lovely four hour drive this morning (and with roughly 3000 miles behind us already)? The other tour members would be begging to have us thrown off the bus before we even reached the new location. And despite protests to the contrary, I don’t think it’s a great idea to take the baby who cries when the mouse frowns because his tail is knotted at the beginning of Cinderella, to see a staged jousting match where there will be fighting… Talk about hysterics. 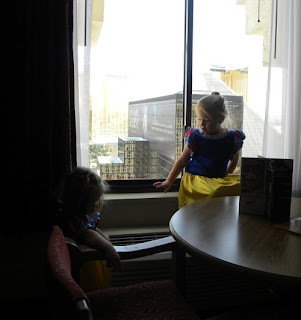 We grabbed lunch at a buffet, and after fending off a half dozen more sales pitches about the new resort, we made it to our room… and then we headed back out to see Vegas. Now I have been to Vegas before. I went to Computer Camp there when I was around 13 while my Dad was in meetings for some school related thing (computer camp? yeah I know…. my coolness factor just keeps going up, right?). Apparently when I was in Vegas, around 1995, it was when Vegas was trying to brand itself as a family friendly travel location, complete with roller coasters and games. After a couple hours walking around the casinos I’d remembered thinking were awesome as a kid (the roller coaster area at the MGM Grand! The river inside the Luxor!) 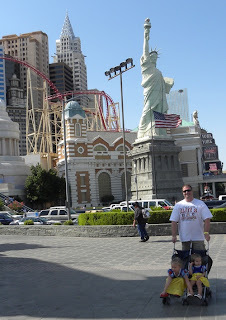 I found that the city had dropped the façade of being family friendly a long time ago and embraced it’s Sin City roots. The MGM, which was all about the Wizard of Oz, complete with indoor Emerald City, when we visited, was dimly lit with dark red lights and was all about being trendy right now. A man at the Luxor informed us that they’d filled the river in 7 years earlier and that we might want to get back to Vegas a little bit more often (before launching into the same tour sales pitch we’d gotten at the Excalibur). We finally made it back to our hotel, exhausted. As we crossed through the door a cute little blonde , in a teensy Excalibur peasant wench costume, came over and gushed over the girls, asking us if we’d like to have their picture taken with them (there was also a couple of six-pack not quite covered men with vests) and assuring us that we didn’t have to buy the pictures. We passed on the pictures, but they did give the girls each a mardi gras necklace, with Sadie for once being speechless. The girl was incredibly nice and genuinely seemed excited to see the girls in their princess dresses. I'd say that she was probably the most pleasant person we encountered on staff in the entire hotel. Then it was on for dinner, which, I will admit, was not my finest moment at the Excalibur. We’d bought passes to the buffet, where the girls ate free, and we had enjoyed lunch there. Mae was fading fast, so we were just looking to go in and eat and get home before she fells asleep at the table. We were escorted to a table and I went to get the girls food and drinks, while Paul waited with them. When I returned, Mae Bae was slumped to one side in a booster seat, looking precarious. Paul informed me that the resort was out of high chairs…. I scanned the room. There wasn’t another baby in sight. I told Paul to wait. Earlier I’d seen a huge pile of high chairs and I was fairly certain I could find them again. I walked around the edge of the room where a friendly older man stopped me and asked if I needed help. I told him we were looking for a high chair for our one year old and he quickly went to get one, assuring me that they had plenty. As I pushed it away he asked why a server hadn’t brought it and I said that we’d been told that they were out of high chairs. At that moment his face fell and I realized that something was not quite right. Then the drama began. The server rushed over and began to lecture us on how you couldn’t have high chairs on tile floors, they were very dangerous and besides it was a fire hazard. Um yeah. It was the same type of high chair in the same restaurant we’d had lunch in (and it was early, so it wasn’t like the place was crowded, it was probably around 3/4 empty...). And that was the unfortunate moment when the pieces began to fit together and the pregnancy hormones began to surge. You see they’d brought us in and told us twice they were going to get the chair. And then I guess someone said no to the chair and rather than move us to another high-chair approved area, they decided it would be better to lie. After all, Mae’s tall just like her sister and ought to be fine in a booster seat… what is that kid, like three (and maybe a 1 year old who isn’t quite as spirited would have done okay…)? But it was pretty clear when the servers story changed rapidly that she’d been lying to begin with. And things went down hill fast. She wanted Mae in that booster seat. I asked if we could move. She pointed to a crowded area with a teeny table. So I interrupted the lecture. No a table won’t work. I tried to remain calm and polite but my volume was rising from its normal quiet level. And if they wanted us to move we’d move. They could move us to one of the booths we were at earlier, where a high chair was okay (apparently she knew where that was since, in the giant restaurant they did end up moving us to the exact same table). She was still arguing at that point though, because I started repeating, with ever increasingly volume, that what bothered me was that they’d been lying to us since we walked in. I think I said it three times with ever increasing volume, before we were whisked to our new table, with every one being suddenly very nice and polite (it only took 20 minutes!). 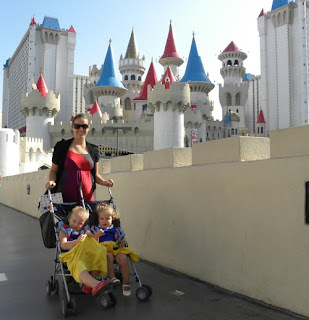 As we finished our last night on the road with the girls falling into bed and quickly falling asleep, I have to say that Vegas isn’t a place I’m planning on visiting again anytime soon, especially with kids. The Excalibur looks cute and kid friendly from the outside, but between the king sized bed for four people (um… going from two beds to one bed is an upgrade? ), the restaurant debacle and the constant harassment from sales people it wasn’t really worth it. Oh, those timeshare vultures are HORRIBLE! I can't believe they targeted you before you even checked in. UGH! Las Vegas is awful! It's all so fake, and not in a fun way. I've been happily married for 35 years, but every time (which is rare) we go to Las Vegas we have a fight (disagreement?). Too bad that if you live in California and need to go out of state to the southeast, you just about have to go through Vegas.